Barry Keane serves as managing director, European Institutional Sales for Virtus Investment Partners International Ltd., the global distribution and service platform for the investment management boutiques of Virtus Investment Partners. Working with Virtus’ existing institutional sales and client service team in the United States, Barry focuses on direct institutional sales and marketing of Virtus’ entire product suite across Europe. Mr. Keane joined Virtus in June 2017 through the firm’s acquisition of RidgeWorth International Ltd. Prior to joining RidgeWorth in 2015, he served as the head of institutional business development at Alliance Trust Investments. In that capacity, he was primarily responsible for the development of institutional business strategy, product development, client management, and global distribution across the institutional market. Previously, he held other senior institutional sales positions as BlackRock Investment Management. Mr. Keane earned a B.A. in economics and English from the University of Galway, Ireland, and an M.B.A. from the University of Durham, UK. He has been in the financial services industry since 2001. 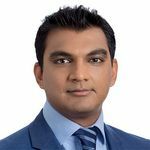 Rahul Shah leads Virtus Investment Partners International’s direct institutional sales and marketing efforts in Europe, the Middle East, Africa (EMEA) and Asia from Virtus’ London office. Working with Virtus’ existing institutional sales and client service team in the United States, Mr. Shah focuses on the marketing of the firm’s strategies to sovereign wealth entities, central banks, and other large institutional clients internationally. Mr. Shah joined Virtus in June 2017 through the firm’s acquisition of RidgeWorth International Ltd. Prior to joining RidgeWorth in 2015, he served as global head of business development, official institutions for London-based State Street Global Advisors. In that capacity, he was primarily responsible for developing relationships and providing solutions for official institutional clients, such as central banks, pension funds, sovereign wealth funds, and government bodies globally. Previously, he held other senior institutional sales roles at State Street Global Advisors and senior business development roles at Commonwealth Bank of Australia, Sydney. Mr. Shah earned a B.Com (Hons) from Osmania University in India and an M.B.A. in finance from La Trobe University in Australia. He began his career in the financial services industry in 1997 at HRH Pvt Ltd in India. We would be happy to discuss our investment solutions with you in greater detail. Please call our London office or use the form below to contact Virtus International and a member of our team will be in touch with you shortly.